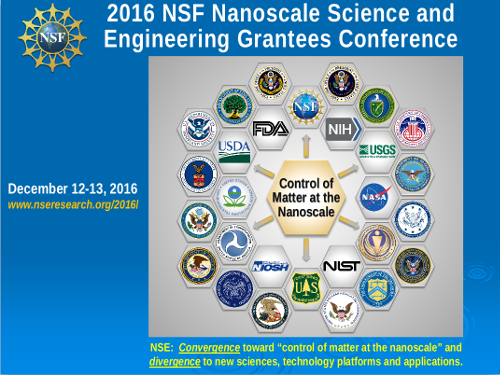 The NSF Nanoscale Science and Engineering (NSE) grantees conference highlights the research and education activities of ongoing NSE grant projects from NSF. Roundtable discussions promote new interdisciplinary partnerships and identify future directions for research, education, networking, business interactions, environmental health and safety, nanomanufacturing, and societal impact. These interactions help to advance the goals of NSF (www.nsf.gov/nano), the U.S. National Nanotechnology Initiative (www.nano.gov), and the 21st Century Nanotechnology Research and Development Act. There will be a dinner and cocktail hour on Monday December 12th from 6-8PM at the Westin Arlington Gateway, sponsored by Hitachi High Technologies America and Raith America. Please RSVP by email to amy.morgan@northwestern.edu by Monday Nov 28th, and include any dietary restrictions you have.